John Belcastro Obituary - SHINNSTON, West Virginia | Harmer Funeral Home, Inc.
A true hero and gentleman, John Belcastro, 96, passed on at the Veterans Nursing Facility on Tuesday, March 19th, 2019 after living a long, happy and fulfilling life providing for his family and serving his country, community, and church. John was one of six sons born to the late Frank and Anita Bartolo Belcastro and the first set of twins born in Shinnston. He was a graduate of Shinnston High School with the class of 1942. John served four years in the U.S. Army during World War II. He was a member of the Tenth Armored Division, 90th Reconnaissance Calvary, the Third Army who served under General George Patton. 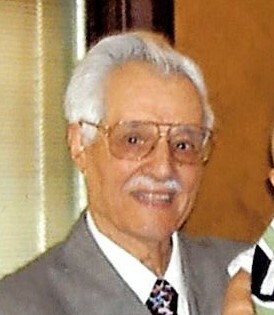 John is survived by his wife of 71 ½ years, Sylvia Cerullo Belcastro, and daughters Tina L. Hanna (David), Anita K. Ballard (Chris); one son John Belcastro II (Kay). He is also survived by four grandchildren; Matthew G. Ballard (Staci) of Charleston, April M O’Neil (Matt) of Pittsburgh, Adam J. Belcastro (Morgan Rynea) of Mt. Clare and Adrienne Compton (Ryan) of Bridgeport; six great-grandchildren, Sylvia, Stella and Gianna Ballard of Charleston, Mason Belcastro of Mount Clare and Brielle and Ayla Compton of Bridgeport; two brothers, Dominick Belcastro of Allied and Lou Belcastro of Lumberport along with many nieces and nephews. John was preceded in death by his twin brother Jim and his brother Joe. In May of 1945 while serving in the Army, he was part of a secret mission to rescue 118 German scientists who defected and became part of the American space program. During his military service, he was awarded a Purple Heart, a Bronze Star for bravery, the Croix De Guerre, Presidential Citation, and the Good Conduct Medal as well as the American Theater Ribbon, the Middle Eastern Theater Ribbon, the WWII Victory Ribbon and a Diploma from the Republique Francaise Minister De La Defense Liberation of France. John worked in the coal industry for 43 years and was a member of the mine rescue squad. He was a member of UMWA local #1501, where he held many offices. John received a 70 year service pin from the UMWA. John had many talents such as performing as an impersonator, making the morning announcements at the Nursing Home and for years served as the “Voice of the Spartans” announcing the Shinnston High football games as well as Shinnston Little League baseball games. He was Cub Master for the Boy Scouts Pack 59, and belonged to the Clarksburg Senior Citizens and was a Meals on Wheels volunteer for many years. John was a lifetime member of the VFW and American Legion and was the captain of the six-time winning Italian Trivia team. In 1999, he was awarded a diploma from the University of Hard Knocks at Alderson-Broaddus College. He was one of the longest serving members of the Board of Directors of the Fairmont Clinic with over 42 years of service. In, 2010 he was inducted into the Shinnston High Hall of Fame. John was a member of St. Ann’s Catholic Church where he served as an usher, lector and president of the Holy Name Society. He was a member of the Knights of Columbus and a weekly adorer in the Blessed Margaret of Castillo Perpetual Adoration Chapel. On June 6, 2013, John traveled to the French Embassy in Washington D.C. to receive a medal honoring him as a Knight of the Legion of Honor and on October 29, 2016 he was honored by having the Haywood Bridge named in his honor. Friends will be received at the Harmer Funeral Home, Shinnston WV from 4 PM to 8 PM Thursday, March 21, 2019 with the Holy Rosary recited at 7:30 PM and 4 PM to 8 PM Friday, March 22, 2019. A mass of Christian Burial will be celebrated at 10:30 AM Saturday March 23rd, 2019 at the St. Ann’s Catholic Church in Shinnston with Father Jude Perera, TOR officiating. Interment will follow at the Shinnston Memorial Cemetery. To send flowers to the family of John Belcastro, please visit our Heartfelt Sympathies Store.